India is a country where most of the consumers prefer fresh and home-cooked food, but with growing urbanisation, increasing disposable income and lack of time for urban working women to prepare a proper meal, consumer are now moving towards convenience food products. Today most of the ready-to-eat food products come into retort packs. The introduction of retorting technology in processed food sector has made the sale of ready-to-eat food products commercially viable with great taste. The retorting or sterilization process ensures the stability of the ready-to-eat foods in retort pouches, on the shelf and at room temperature. The application of sterilization technology completely destroys all potentially harmful micro-organisms, thereby making sure that the food product has a very long shelf life of over 12 months and needed no refrigeration. Convenience food items such as ready-to-eat products not only serve to save time but it’s more hygienic than traditional Tiffin boxes or Dabbawallas. Currently the market size of Ready to eat products is approximately around Rs 100 crore. Other factors that contributed to the growth of ready-to-eat segment includes - cold chain development, more powerful logistic support, technology and packaging innovation and of course the growth of modern retail trade. Also the pricing of ready-to-eat food products is done keeping in mind competitive products as well as other sources of ready foods like restaurants. 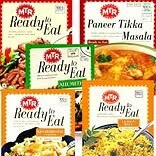 MTR Foods offer a wide range of ready-to-eat dishes, ranging from South Indian, North Indian, Main Course to Snacks. As per Sabherwal, ready-to-eat category contributes 10 percent of the company’s overall revenue. With the increased demand of ready-to-eat food in domestic market, and growing regional, national and international brands in market such as Kohinoor Foods Limited, ITC Limited’s leading brand Kitchens of India, MTR Foods Private Limited, Gits Food Products Private Limited and Haldiram Manufacturing Company Limited, manufacturers of ready-to-eat foods in India are now targeting international markets. MTR Foods also exports 10 percent of its total business mainly in the US and some other key countries globally.